Matcha tea is a concentrated form of green tea that uses much more of the plant than you might get from a regular tea bag. Typically, you make tea by steeping a bag of tea leaves in water to the desired strength, but matcha goes a step further: it’s a powder, made from green tea leaves and mixed into a bowl of hot, but not boiling, water. While there are some benefits to green tea, there are greater benefits to matcha tea because of its potent mix of vitamins, minerals, antioxidants, and amino acids. You would have to drink a few cups of regular green tea to benefit from the nutrient profile of a single two-ounce serving of matcha green tea. All tea—black, green, white, oolong—comes from the Camellia sinensis plant; herbal teas don’t count. 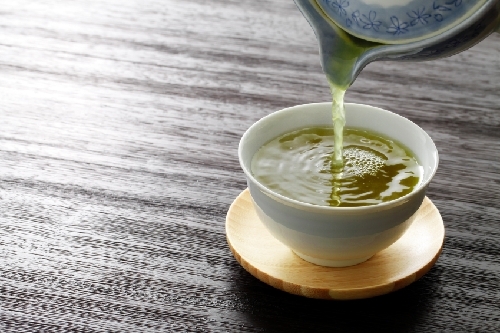 In 1191, green tea was brought to Japan from China, and its leaves were first ground up by Zen monk Eisai. In Japanese, the word ma means powder and cha means tea. There are two grades of matcha. The first is ceremonial grade, used for drinking, and the second is food grade, which, as the name suggests, is used in baking and cooking. The ceremonial grade is of a higher quality and the taste difference is noticeable, especially when it comes to how bitter it is and how smooth it feels. The higher the grade, the smoother and less bitter the matcha. You can, of course, certainly use the ceremonial grade in baking, but it’s more expensive so you’re better off using the food grade. 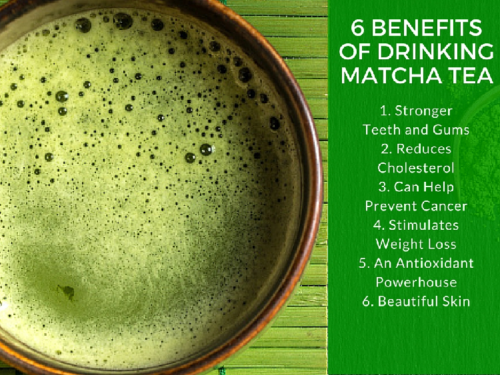 Matcha tea has several benefits. It’s loaded with antioxidants, boosts metabolism and burns calories, calms the mind, relaxes the body, helps concentration, and lowers cholesterol and blood sugar, plus it’s packed full of fiber, chlorophyll, vitamin C, selenium, chromium, zinc, and magnesium. Let’s look at a few more benefits in greater detail. A recently published study from the Journal of Periodontology shows that drinking green tea regularly could possibly help keep teeth and gums healthy. The study followed the periodontal health of 940 men; those who drank green tea regularly had better periodontal health. Matcha green tea’s ability to lower cholesterol, and, by extension, help prevent heart disease and other cardiovascular diseases comes down to the powerful amount of catechin polyphenols. These are natural compounds which have high levels of antioxidants. The most important polyphenol in matcha is EGCG, which has been the subject of many studies. According to the National Cancer Institute, the catechins in matcha green tea may help prevent cancer. This is possible because the chemicals in green tea, especially EGCG and ECG, protect cells from DNA damage caused by oxidization. Research using lab animals also shows that tea polyphenols can inhibit the development of tumor cells and destroy cancer cells. Furthermore, the catechins in green tea have been shown to improve how the immune system works. Matcha tea may benefit weight loss efforts. How can a tea help you lose weight? It’s simple. First, matcha is thermogenic, meaning it causes the body’s overall core temperature to rise up, which automatically has your body burning calories. Matcha boosts metabolism, burns fat, and is very low in calories, so drink a few cups a day as a part of your healthy eating regimen. Matcha tea for weight loss might be your new mantra! Antioxidants are naturally occurring chemical compounds which can help prevent some chronic diseases and the effects of aging. Many fruits and vegetables provide antioxidants, but matcha is one of the best ways to get them. Research has shown that matcha has 20 times more antioxidants than blueberries. Matcha tea also benefits the skin. It might sound odd, but if you think about it, the act of applying food to the face and body for beauty enhancement isn’t a new idea; it’s been practiced since the time of Cleopatra where she reportedly took baths of milk and honey to promote soft skin. Today, milk and honey are still very much used in cosmetic and beauty products because of their skin-softening qualities. Much the same can be said for matcha tea. You don’t need to spend money on commercial facials if you don’t want to; with a few ingredients you can make a powerful beauty-enhancing facial right in the comfort of your own home. Here’s how. Combine half a cup of plain Greek yogurt, a tablespoon of matcha, and a tablespoon of honey into a bowl. Apply to freshly washed skin and let it sit for up to an hour. The lactic acid and the honey will soften the skin and promote cell regeneration, and the matcha will deliver powerful antioxidants directly to the skin cells where they will help fight the aging effects of free radicals. This recipe is so gentle you can use it every day if you so choose. The proper way to make matcha tea is with a bamboo whisk and a tea bowl. If you visit a tea shop they will most likely carry a matcha tea set starter kit which will have the whisk, bowl, and a tin of tea to get you started. 1. Add two teaspoons of matcha to the bowl. 2. Heat up some water, but stop just before it boils. 3. Add two ounces (1/4 cup) of the water to the bowl. 4. Whisk vigorously until frothy. 5. Drink the tea directly from the bowl. It doesn’t need sugar or milk. 1. Combine in a blender until smooth. Matcha tea powder can be added to many recipes, including baked goods (muffins, cakes, cookies, brownies, and even fudge) as well as pancake and crepe recipes. Use your imagination to find creative ways to slip this amazing green powder into your diet. Matcha tea has benefits, but side effects do exist. For example, drinking large amounts of green tea can cause liver problems, but should be no issues if you drink it in moderation. As with other teas, caffeine might be an issue for some people, especially pregnant women. Talk to your doctor before drinking matcha green tea to ensure that it’s OK for you to have it during your pregnancy. Children can drink matcha green tea as well, but because it contains caffeine, be mindful of how much they have and when they consume it.